By studying analogs of deep space ice, scientists might be able to learn more about how life on Earth could have evolved. Sugars may form in the types of ice found in deep space — a finding that could help to explain how comets and meteorites could have seeded the primordial Earth with key ingredients for life, researchers say. In the dense molecular clouds from which stars and planetary systems are born, ices are, by far, the most abundant solids. Prior research had found that cosmic rays and ultraviolet radiation can help convert the chemicals that make up the bulk of these interstellar ices into complex organic matter, such as the precursors of proteins and fats. Now, scientists have detected sugars in experiments that mimic the way interstellar ices can evolve over time. Sugars are more than just sweet nutrients; they serve as the backbones of nucleotides, which, in turn, serve as the building blocks of the nucleic acids that make up DNA and its cousin RNA. "DNA is the genetic source code for all known living organisms,"study co-author Uwe Meierhenrich, a chemist at the University of Nice Sophia Antipolis in France, told Space.com. 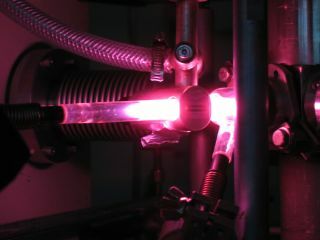 In the experiments, scientists created thin films made up of frozen water, methanol and ammonia in a vacuum chamber kept at minus 319 degrees Fahrenheit (minus 195 degrees Celsius). They irradiated these ices with ultraviolet rays to mimic how such material would evolve over time in interstellar space. Then, they slowly warmed the samples to room temperature and analyzed them. In a first-of-its-kind discovery, the researchers detected compounds known as aldehydes. Most sugars derive from these compounds; the simplest and best-known example of an aldehyde is formaldehyde. Among the 10 aldehydes the scientists detected were two sugar-related compounds, glycolaldehyde and glyceraldehyde — key precursors of nucleic acids, the building blocks of genetic material. "Glyceraldehyde is a molecule of outstanding importance," Meierhenrich said. The researchers cautioned that their experiments did not create life, but rather only the key building blocks for life. Still, they said these findings may help reveal how ancient comets and meteorites might have seeded a lifeless Earth and other planets with the chemistry needed for life to evolve. Future research into interstellar ices can explore the mystery of why the compounds that make up life on Earth usually come in one form but not the other, the researchers said. Many organic molecules can come in two different forms that are mirror images of each other, like left and right hands. DNA on Earth is usually "right-handed," not "left-handed," because the sugar that makes up DNA's backbone is "right-handed." In the future, the scientists would like to investigate whether sugars in interstellar ices might also be either left-handed or right-handed. The scientists detailed their findings online today (Jan. 12) in the journal Proceedings of the National Academy of Sciences.